Welcome to Critic's Notebook, a quick and off-the-cuff car review consisting of impressions, jottings, and marginalia regarding whatever The Drive writers happen to be driving. 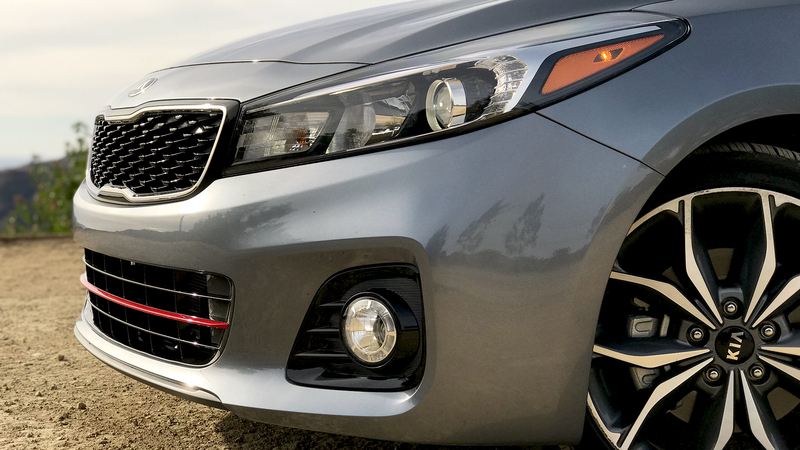 Today's edition: the 2017 Kia Forte5 SX T-GDI. It was mid-December, and California was burning. The massive Thomas Fire had raged into its second week in Ventura County, charring untold acres of chaparral made lush by spring's biblical rains then withered by a punishingly hot summer. The Santa Ana winds gave no quarter, and smoke hung in the hot, yellow air across the Los Angeles Basin. I needed some relief. 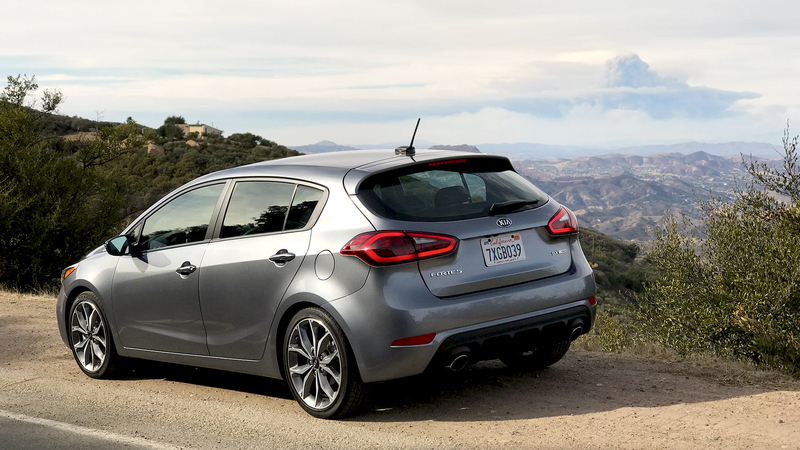 How better to find clearer skies than a drive into the hills in a sporty hatchback with a six-speed manual? We're at the tail end of the big bang for hot hatches in America; icons like the Ford Focus ST and RS and the Fiat 500 Abarth have come into their own this decade, while old standbys like the Volkswagen GTI, and the Honda Civic Si, Sport, and Type R have been born anew. And if all you want is a fifth door with a little pep, nearly everyone's got a sportback something-or-other on the market today. The Kia Forte5 SX Turbo slots somewhere in the middle. Call it a heat-lamped hatch. At first, it feels like the promise of the Kia Stinger has translated into a Korean GTI-killer. It's light, nimble, fun, and more mature than it needs to be. The red stripe on the bumper is a little too cute, but overall, it looks the part and should hit the right chords for buyers in this segment. In Phantom Grey like mine was, it's a four-wheeled Mighty Mouse, diving through the canyons and skipping over hilltops. 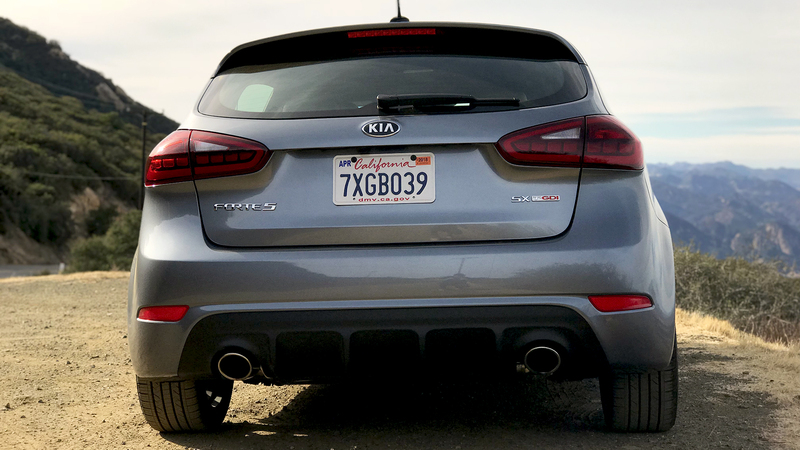 The more I drive, though, the harder it became to outrun reality: This Kia is too soft to be a true hot hatch, too compromised to be considered premium. And as I round a corner with the brakes giving off a telltale squeal, I see it: the Thomas Fire smoke plume, an ashy mushroom cloud towering miles above the horizon. Things always catch up to you in the end. The interior is surprisingly expansive for such a diminutive car, including the back seat. 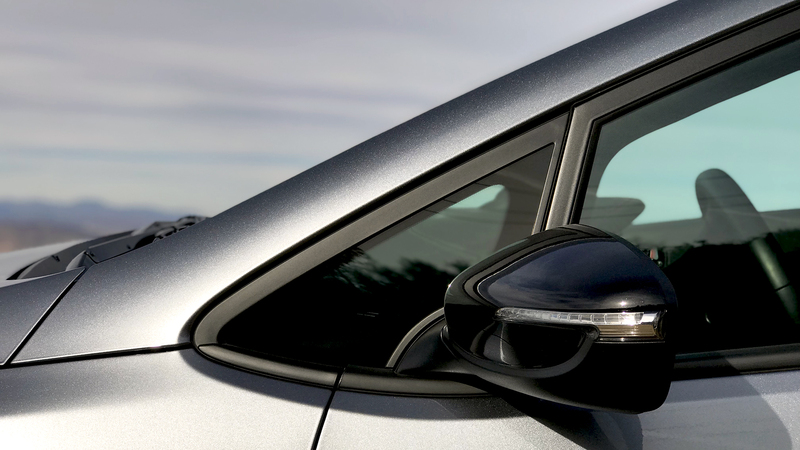 And the downward-angled windshield and nose lend themselves to excellent forward and side visibility. The thin A-pillars help a lot, as well. (And whatever happened to quarter glass on modern cars, outside of this one?) Some may find the orange-accented seats a little garish, but I thought they helped break up the black interior. There are a few nice touches to highlight the SX's sporting pretensions, too, like the center stack on the dashboard being angled slightly toward the driver. 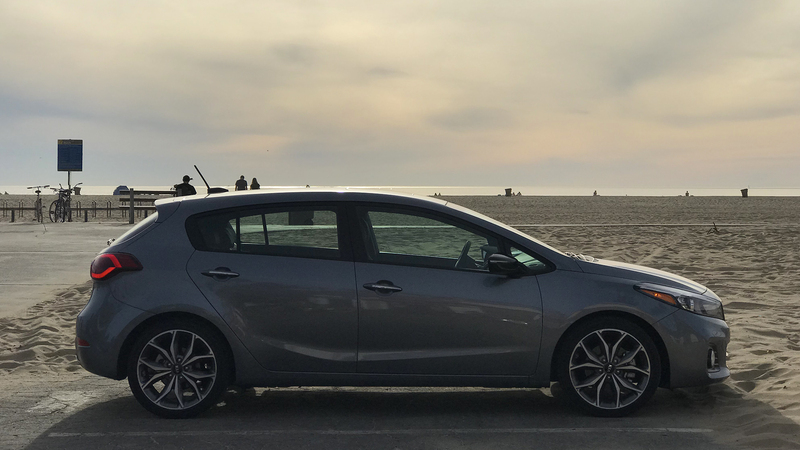 The six-speed manual transmission is good old-fashioned fun, and while the action is a little ropey, the clutch is solid yet light enough to operate easily in world-famous Los Angeles rush hour traffic. The engine—a turbocharged, 1.6-liter inline-four with 201 horsepower and 195 lb-ft of torque—is a punchy little unit that hides turbo lag well and scoots around the 3,000-pound hatch with ease. 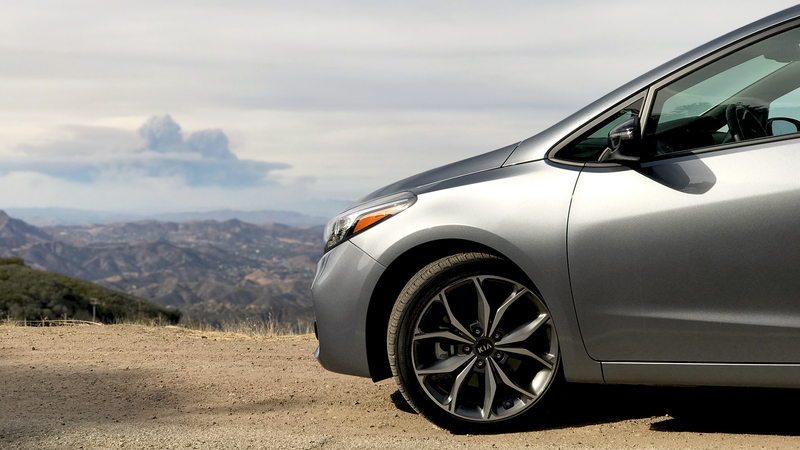 From its straightforward take on a sport-tuned hatch to its absurd SX T-GDI badge, the Forte5 feels like a simpler car from a simpler time—which I mean in the best way possible. The interior feels open and airy in a way few modern small cars do. The exterior eschews the swoops and creases that have turned so many models into robot origami. The gauges are a simple analog affair. Even the name, endearingly clunky as it may be, actually stands for something: Turbo-Gasoline Direct Injection. It doesn't feel heavy or numb or overly complex; instead, it pulls off the sort of pleasant competence that's sorely missing from the lower-middle of the market these days. And if you're looking to save a bit off the $26,000 sticker of my tester, grab a closeout 2017 model; the 2018 Forte5 SX is literally the same car. With that in mind, where does it fit into the warm/hot hatch segment when you start talking price? My tester had an MSRP of $26,125, which works out to be a few thousand dollars cheaper than a comparable VW GTI (though the base model drives just as nice), right on par with a Ford Focus ST, and a bit more than a fully-loaded 2018 Mazda3 Grand Touring. That math is already a little tough, but it's complicated by the weird pricing structure Kia uses with the Forte5. The top-of-the-line SX model starts at $23,800 with the fancy dual-clutch automatic transmission as standard, while the old-school six-speed can only be had as a single $2,200 option that incorporates a lot of premium interior features as well. The infotainment design could use a big update in terms of style and software. There's no compelling reason to even bother with Kia's proprietary Uvo app suite, which is both clunky and redundant since both Apple CarPlay and Android Auto are available. Given that anybody who buys this car is bound to have a smartphone, it makes me wonder how much better (or cheaper) the car could be if Kia (and all car companies, really) diverted resources away from fighting this losing war against tech companies who actually know what they're doing. For some reason, designers thought it would be a good idea to use fake carbon fiber as an accent piece on the dashboard in their supposed premium model. C'mon, guys, that's half the reason Scion died. And the upmarket vibe is ruined by a few other disappointments, like the stiff seats whose ventilation function seems to run on placebo effect alone and the sport-tuned suspension that fails to mask the cheaper torsion beam rear end not found on the mechanically-similar Hyundai Elantra GT Sport. I should be clear: This is not a bad car. In fact, it's remarkable how far the Forte has come from its roots as one of the more vanilla choices in the small economy segment, and the Forte5 SX Turbo is a reflection of Kia's progression over the last decade as well. It's best appreciated as a single prong in the company's assault on established performance cars—the Kia Stinger being the obvious main charge—because impressive as it is in a vacuum, it's not quite at the level of the competition. Back in the mountains, after pulling over and taking in the apocalyptic view, I almost felt guilty having spent the last hour wringing the car out like a proper hot hatch. I could smell the brakes, and the fear of a desiccated leaf coming into contact with an overheated part and sparking another conflagration washed over me. Far-fetched, to be sure. But a strong reminder that the Forte5 SX is less than suited for aggressive driving, and that a serious appearances can be skin metal deep. I'll spare you the cleansing fire metaphor—Kia's rebirth and growth has been a mostly positive sight. And at seven years of age, the current Forte has morphed into a mostly positive car. But things must keep improving.